Our cube game for thinking and intuitive players. 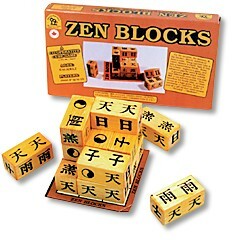 Symbols on the blocks are matched to form a cube, like dominoes in 3-D. Easy games for the young to try, and tough games for teens and adults. Not a one solution puzzle, but a genuine game that unfolds differently each time. Excellent for family play, in schools as a logic game, by groups assessing co-operative skills or just as a gift for that clever person. Can you bring together the opposites to form a complete whole? Full explanations of the meanings of the symbols are given. Includes: 4" oil-finished silk-screened blocks, play pad, illustrated rules.